In the field of lithic reduction, a burin /ˈbjuːrɪn/ (from the French burin, meaning "cold chisel" or modern engraving burin) is a type of handheld lithic flake with a chisel-like edge which prehistoric humans used for engraving or for carving wood or bone. Burins exhibit a feature called a "burin spall", in which toolmakers strike a small flake obliquely from the edge of the burin flake in order to form the graving edge. 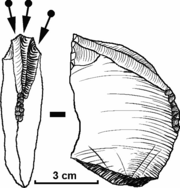 Burin usage is diagnostic of Upper Palaeolithic cultures in Europe, but archaeologists have also identified it in North American cultural assemblages, and in his book Early Man in China, Jia Lanpo of Beijing University lists dihedral burins and burins for truncation among artifacts uncovered along the banks of the Liyigon river near Xujiayao. An example of a type of burin diagnostic of the archaeological stratum where they are found is the "Noailles" burin, named for its original find-site, the Grotte de Noailles, in the commune of Brive-la-Gaillarde, Corrèze, in southwestern France. 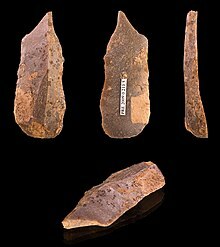 It consists of a small multiple burin characteristic of the Upper Paleolithic cultural stage called the Gravettian, ca. 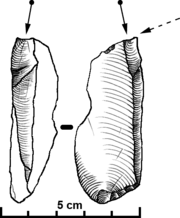 28–23,000 BC; these flake tools have been restruck and refined to give several chisellike edges and a blunt, grippable rear edge. One type of burin is called the "ordinary burin", which occurs when a burin facet is backed against another burin facet. ^ Burkitt, M. C. (1928). South Africa's Past in Stone and Paint. Cambridge University Press. p. 82. ISBN 9781107641334. Retrieved 2017-08-21.